The volume figure drags a mouse is no more difficult than flat items made in the technique of parallel braiding. In fact, here and use this technique. The only difference is that the series of canvases stacked not in one plane and going to "accordion". Schematic diagram of the products shown in the figure below. Numbers above indicate the number of (number repeated twice because the first number number number sootvetsyavuet tummy, and the second - the back). The numbers below - indicate the number of beads in this row. 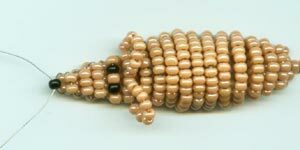 You will need about one meter long wire, beads of the base color (whether your mouse white, gray or even pink - you decide) and the three black beads. 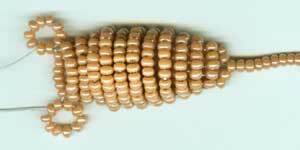 In the diagram, white, shorter series to form a mouse stomach (lower part), gray, longer - back (upper part).When weaving the upper twelfth series (ears), note that in some beads wire runs three times: select beads with larger holes. If you've never spun like three-dimensional figures, it is described in detail below it - for you. 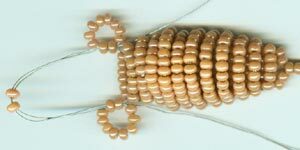 Type in a wire bead and place it in the middle. 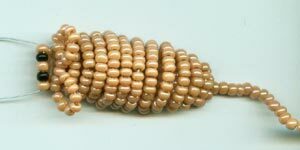 Fold the ends of the wires together and put on both ends of the 15 beads. Tighten the wire. This tail mouse. At each end of the wire type with two beads. Scored four beads form a first row of the tummy. At one end of the wire type 5 beads and thread them through the other end of the wire in the opposite direction. This is the first series back. At one end of the wire type 5 beads and thread them through the other end of the wire in the opposite direction. Pulling the wire, put a number so that he was placed under a number of backs. This is the second series of tummy. Weave the second row back, typing on one end of the wire 7 beads and sell them through the other end of the wire in the opposite direction. For the third series of tummy type 6 beads at one end of the wire and thread through them the other end of the wire in the opposite direction . Continue to weave the body a little mouse in this way.Make sure that all the rows back, "lay down" on one side of the figure, and the series tummy - on the other. Short series tummy a straight surface. Longer series back bend, creating a convex surface. In the 12th row back weave ears mouse. At one end of the wire type 10 beads. This is the end of the wire go through the first two beads recruited in the same direction. Hold the two beads at the base of the fingers and gently tighten the wire in her ring. One ear is ready. Type 10 beads on the other end of the wire and thread it through the first two scored beads. Tighten the wire into the ring. Finish second tab. 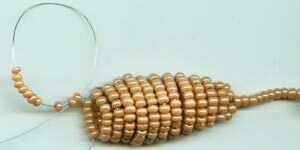 At the right end of the wire, place two beads, thread it through the two beads at the base of the left eye (do not tighten until the wire). Thread the other end of the wire through the two beads and scored two beads at the base of the right eye. Gently pull both ends of the wire. Weave 13th series tummy, and then proceed to the 13th row back. Do not forget to eyes in this series. Continue weaving for the scheme. Black bead for the nose can take a little larger than the core beads. Each end of wire through a black thread the bead, leaving the loop.Gently twist the wire ends with eyelets near the bead. Trim the ends of the wire.Completed the final touch - a little mouse whiskers. Left them a little tweak, bend and straighten your ears tail.